I met the young poet on a social media site. Over the past few months we’ve become friends – more than friends I guess. She addresses me in Urdu, her native language, as big brother. I address her in Spanish as my little sister. 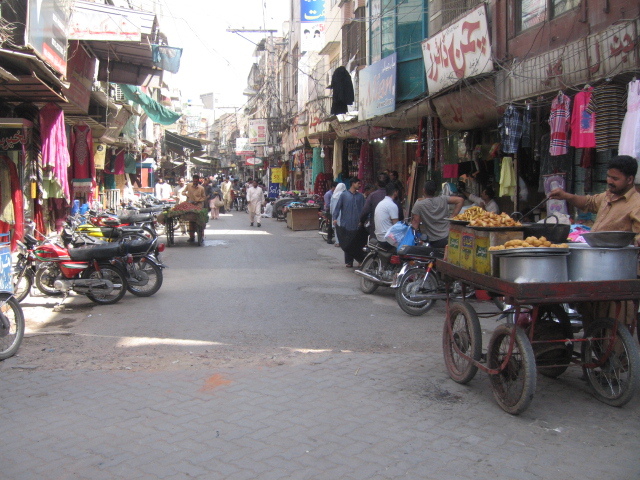 Odd to me, having such a relationship with someone on almost the exact opposite side of the world…Sialkot, Pakistan – the City of Poets. I asked my little sister, the poet Maryam Shabhaz, if she would visit the shrine of Allama Iqbal, the national poet of Pakistan and another native of Sialkot, to give readers an idea of the importance of poets in her country. She sent me these photos of her pilgrimage. My own speech was like a meaningless word to me. The noise of the door chain would comfort me. And how surprised would I be at that prudent lie. My heart was no less than inquisitiveness personified. 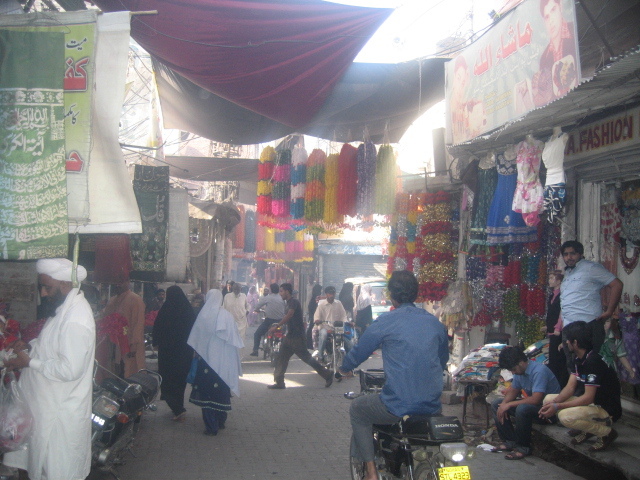 Maryam, it seems, stopped off in the market…did a little shopping around. 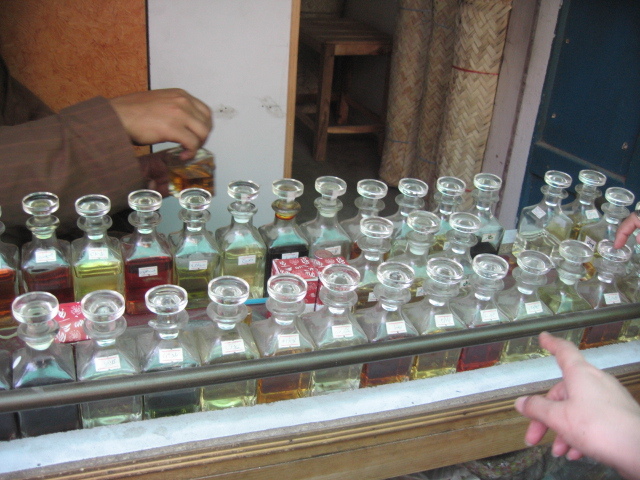 Here she photographed a dealer of essential oils, Ittar in Arabic…herbal scents distilled for perfume and home use. 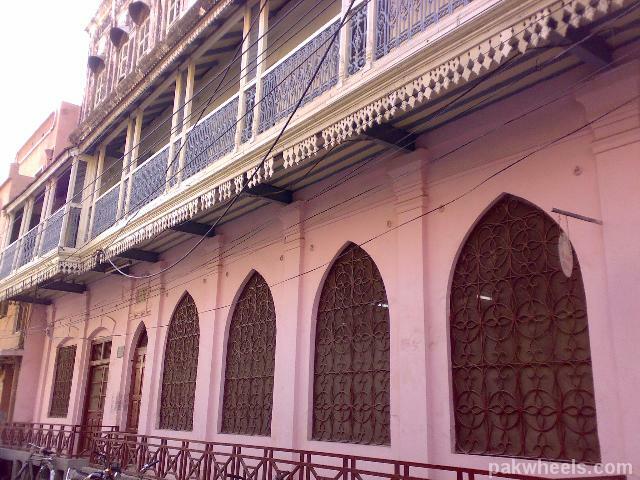 The next photo she sent me was of the exterior of Dr. Sahib Iqbal’s former home. I think I’ll let an excerpt of Maryam’s poem The Departed Soul speak for the reverence Pakistanis have for a national hero, one so revered he has a national holiday named in his honor. Wait to embrace the departed soul. At last, men realize, memories aren’t sacred holes. Mr. Riaz, the caretaker of Allama Iqbal’s shrine, told Maryam that photographs were not allowed in deference to the memory the poet, scholar, and politician that had such an impact on Pakistani independence. She told him about the project she was working on, and he agreed the photos were for a noble cause, giving her the unheard of permission to take photos. 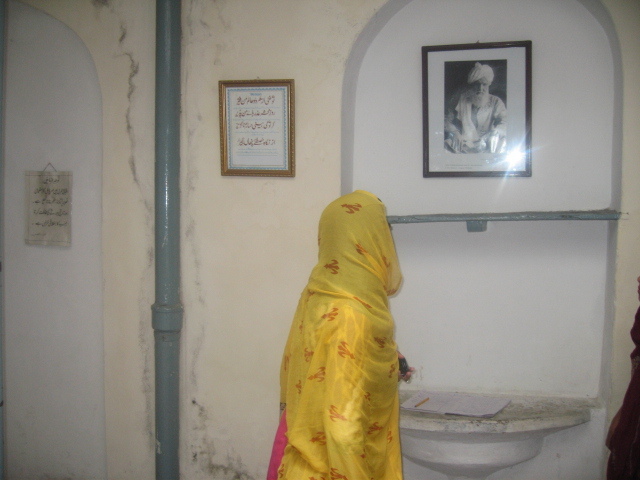 The first photo inside the former home and current shrine to Dr. Sahib Iqbal is of Maryam signing the guest register. Between 50 and 75 Pakastanis a day visit the shrine, with the number rising to 300 or so when a college or school arranges a visit. The visitors who had signed the register before Maryam were from Rawalpindi, and Mr. Riaz pointed out a former Foreign Minister of Pakistan who had signed the register not long ago,misspelling Islamabad, the capital city in which he had exercised his official duties. I guess politicians are the same everywhere. The final entry to this introduction to Allama Muhhamad Iqbal, and to this introduction to Maryam Shahbas and her poetry, will contain photos taken in the former home and current shrine to Dr. Sahib Iqbal, and will be accompanied by one of his most famous naats, or religious praise poems. Maryam Shahbaz’s poetry can be viewed on WordPress under the name Maryamshahbazmian. This entry was posted in Photography, Social Media, Writings and tagged Friendship, History, Human Rights, literature, Pakistan, Photography, Social media, writing, Writings. You are very lucky to be able to travel. The world is a amazing place. I like the photos and description of your journey. Thanks for reading and the comment. If I keep moving, hold my judgments until I know something other than prejudice, and listen more than I speak, it all seems to work out. Coyoter Power ! One more bit about this – a mystery. My friend! You have such a gift when it comes to being able to take complex news and ideas and cut right to the bone with it, picking the words that give me chills when I read them. Your writing is an art that I never get tired of reading, from book reviews to the a walk on the beach to telling stories of friends and family half a world away. Cheers, my friend, cheers! Again I have risen above myself somehow. I always feel like my feet are stuck in concrete when praised for doing something so basic and natural to me it seems childish, almost. Thanks. Have to go fight with the wife now and kick the local dog. Reblogged this on memories of my ghost sista. Thanks, again. You know I’m going to use that thought about ittar…comparing the essence of poetry and its effect on some people with the essence of ittar and the its effect on some people. That would be another post to look forward and such an amazing thing to choose. Always took it as something auspicious as a child as everyone around me carried it in smallest bottles and used them for Eid or any other special occasion. Never thought about the reasons why until you said so. Just put up a post on Char’s site with some photos I’m not using. A bit of poetry from Allama Iqbal, and a lot of green. Check it out.